The relation of the keyboard to the monitor on a laptop is fixed. Viewing laptop monitors placed on a desk or table requires users to lean forward and bend their neck downward to view the screen. Prolonged bent postures can cause serious neck, shoulder, and back problems. Proper ergonomic monitor setup positions the top of the monitor level with the user’s forehead for upright head posture. Sit up straight and look straight ahead. 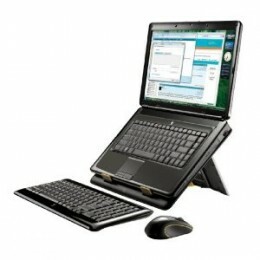 Using a laptop stand will allow you to position your monitor height at eye level according to your height and/or individual visual needs. Laptop keyboards are often compact with odd placement of some keys and cramped spacing of others. To prevent hand, wrist, and elbow pain – do not use the small keyboard for prolonged periods. Use an external keyboard. Standard-size keyboards provide the appropriate space needed for relaxed comfortable hand postures. You can easily plug a standard keyboard into the USB port into your laptop at the office, at home, or even your hotel. Laptops typically have a touch pad or dot. These devices are adequate for quick computer reference, but not comfortable for long periods of time. Wrist, hand and finger related stress injuries can result from prolonged laptop pointer device use. Use an external mouse. Any kind of mouse will give you more hand movement and freedom to control your pointing device and will reduce cramping on your wrists, hands and fingers. If you would like additonal information regarding your particular laptop setup, or discomfort issues you may be experiencing, please contact us and our Ergonomic Consultants can recommend the appropriate solutions for you. Contact CESSI Ergonomics at 800-289-ERGO or via the contact form below. ‹ Which Ergonomic Product Fits All Workers Regardless of Height, Stature, or Shape?